Eva Marie Everson is such a talented author and I was exited to see that a new book was coming out. I was not disappointed at all when I received the book and began reading. "Five Brides" tells the story of just that - five different brides all connected by a dress. 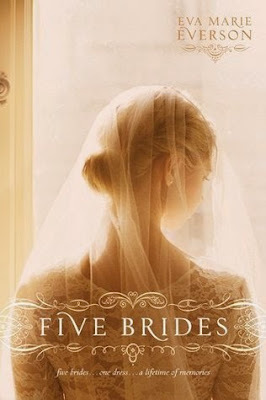 I loved how this book was written as each of the five brides had their moments in the spotlight and yet their stories and characters all wove together so seamlessly and beautifully. This is such a beautiful, and well-written story that stays with the reader long after you finish reading which has been my experience with Eva's previous books as well. I must add that I love the cover of this book as well, so elegant, simple and beautiful. I have been so looking forward to reading this book since I finished book #1, "At Bluebonnet Lake" and I was not disappointed! I loved revisiting this resort, cute little town and the characters (along with a few new ones as well!). Marisa has to return home after losing her job and she is forced to deal with some past issues and try to be content and move on with her life. I liked her as a main character as I thought she was easy to relate to and Amanda did a great job with developing her character and bringing out the main sides to her - her working/professional side, her personal side by being a friend to Lauren and tying in the baggage from her childhood into all of this as well. Blake was a fun main character as well and I loved reading the interactions between he and Marissa and Carmen as well. The story flowed well and I did not want it to end. This is a great story of second chances and a series not to be missed! I really enjoyed book #1 in Shelley Shepard Gray's new series and I was excited that book #2 came out so soon after. This series has been different from typical Amish stories and I love the different setting, but yet it still holds true to the Amish culture. Penny feels smothered and "babied" by her parents due to a horrific event that occurred years earlier; however she is determined to follow her heart and stand up for herself. Michael suffered through a terrible ordeal and his life has changed as a result of that too, but he is ready for another change. This was a sweet story of two individuals following their hearts and finding their own paths and relying on God. I also enjoyed all of the extras Shelley included at the end of the book, the recipes, the photos, discussion question and sneak peak. I am looking forward to book #3! Childhood obesity is an issue in today's society and Heidi shares her story about how she addressed and overcame this issue in her family in her book, "Who's the New Kid?" This is a great resource for families struggling with this issue as well. Heidi loved to cook and she and her husband did not really think about the food they were eating, just if it tasted good or not. After Breanna was born and began eating regular food, Heidi was thrilled that she enjoyed eating and was not a picky eater as children can be. However, when Breanna was being teased at the age of three, concerns began. Heidi shares her struggles and also how she was able to tackle this issue head on and how the whole family made lifestyle changes successfully. There are so many pieces to this as there is the emotional component, in addition to making an effort to live a physically active life and make healthy eating choices. Heidi includes a complete eating plan for 40 days and also recipes that the family loves and are also healthy. One tip that is a great one is to keep a food diary as this makes you really aware of what exactly you are eating, and also helps you to think twice. Thanks to Heidi and Breanna for sharing their story in order to help other children and families. "As Waters Gone By" by Cynthis Ruchti is one of those books that immediately draws the reader completely into and stays long after the story is done. Emmalyn had a happy life, seemingly content, until she missed a phone call from her husband by three minutes. These three seconds cause her life to completely change and she is faced with some hard trials to face and decisions to make. Emmalyn was easy to empathize with and I found myself through the book asking myself what I would do if I were in her shoes and I honestly didn't have clear answers. This story is a great summer read as Emmalyn is on an island sorting through her thoughts and life and working on a cottage, truly a summer setting. This is an emotional read with so many layers to it and one that leaves the reader with hope at the end. I was not really sure what to expect with this book, as the title honestly caught me off guard. However, the very first page dove my into my doubts and also immediately hooked me on the book. "Never Say No" is a must-read parenting book and really taking each moment and enjoying it and enjoying your kids. This addresses picking battles and finding that right balance between limits, freedom and saying yes in order to spend time together with your children discovering their interests and building your relationship together. The section addressing imagination and how so many are losing their imaginations is so important to understand as this is such a growing concern more and more with how media saturated everyone is now. I also love the discussion of traditions as traditions have always been an important piece of my life to me and I have carried some over from my childhood and also been trying to create new ones with my children. The discussion questions at the end of the chapters are a great addition to the book as well as they really helped me to apply and reflect on how I am raising my children. 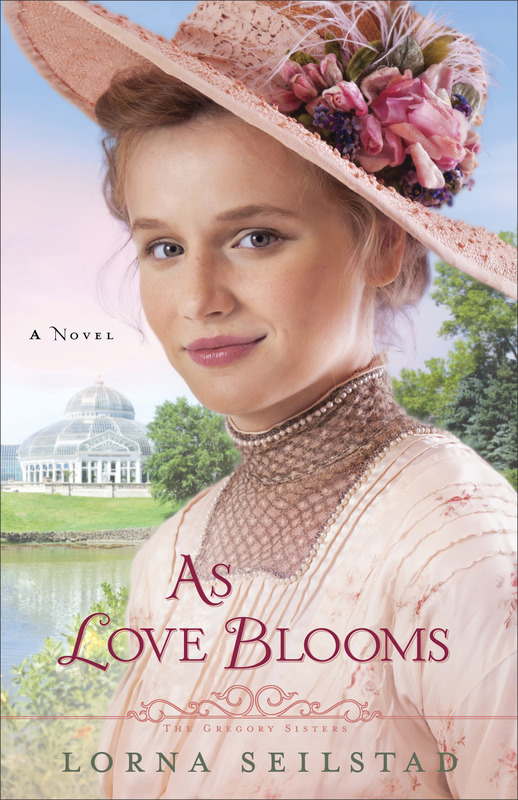 I became a fan of Lorna's books as soon as I read her first one and I loved her latest book, "As Love Blooms!" This was the conclusion to the Gregory Sisters trilogy and I enjoyed spending time with these sisters, whom all chose careers in a men's world and found love and were supported and loved by Aunt Sam. Tessa was such a fun character to spend time with and I loved her dreams and plans for the gardens and the extreme measures she took to help her implement her plans and follow her dreams. I could picture the flowers and the layout in my head of Tessa's designs and I felt like Lorna did an excellent job of bringing the time period to life. I highly recommend Lorna's books for fan of historical fiction. This is a great cookbook to add to your home collection! It is filled a nice variety of recipes - all ones that are good for you, and they are also all pretty easy to make and have common ingredients overall. What I love most about this book is how it is divided up. The recipes are sorted and shared together by cooking style. Some days are perfect for using the slow cooker, while others you may prefer to have a stovetop dish or grill out. I know personally for me while menu planning for the week I look at my schedule and decide what my day overall is going to look like and how much prep time I will have for cooking and when that time will be and go from there as far as deciding the cooking style and what specific recipe. This is a great collection of recipes that will be used frequently. "A Heart's Danger" is book #3 in Colleen Coble's Journey of the Heart collection and I loved spending a little bit more time with Rand and Sarah and continuing on this journey with them. As tension mounts between the Sioux and the soldiers, everyone is on edge and then things happen which cause them to question the other group and those among themselves as well. Rand's fiancée Jessica is so jealous of Sarah that she devises a plan with Ben; however Ben takes the plan an additional step placing Rand in danger as well. This is a suspenseful part of the story and I was immediately drawn into the story. With each addition to the collection I get to the know the characters, all of them, more and more and I am looking forward to what happens next in the saga! "Called To Be Amish: my journey from head majorette to the old order," is Marlene C. Miller's story of joining the Amish culture and way of life. Marlene shares heart-wrenching details of her life and what led her to making this choice to join an Amish community. Although the Amish way of life is so different from the English world, this lifestyle and commitment that Marlene made is what turned her life around and fulfilled her. This book is very well-written as it will tug at your heartstrings and really allow you into Marlene's world. There are pictures interspersed throughout the book which is a great addition to Marlene's story as well. "No Place To Hide" is book 3 in Lynette Eason's Hidden Identities series and I have loved this whole series! Jackie is a part of Operation Refuge and when she sees Ian's face on the news as he is wanted as he is a suspected terrorist, she knows it's not true and she sets out to help him. As Ian and Jackie find themselves on the run, they find that there is no place they are completely safe and they must fight for their lives as well as finding out who set Ian up and what the coded message really means. Jackie's past is slowly unraveled throughout this book as she and Ian are on the run and trying to figure out what is going on and what happened in the past as well. Jackie relies on Ron as she knows she can trust him and won't put in him harm's way as people continue to be targeted and killed. I really enjoyed this book and reading more about the individuals with Operation Refuge who were the main characters in the previous novels in the series. This is a fast-paced and tense novel that keeps your attention from the very beginning to the very end. About the author: Kim Vogel Sawyer is the author of twenty-nine novels, including several CBA and ECPA bestsellers. Her books have won the ACFW Book of the Year Award, the Gayle Wilson Award of Excellence, and the Inspirational Readers Choice Award. Kim is active in her church, where she leads women's fellowship and participates in both voice and bell choirs. In her spare time, she enjoys drama, quilting, and calligraphy. Kim and her husband, Don, reside in central Kansas, and have three daughters and nine grandchildren. 'When Grace Sings" is the second book in Kim Vogel Sawyer's Zimmerman Restoration Trilogy and continues the story of Alexa and Anna-Grace along with all of the other characters whom we met in book one. These books should be read in order as the story continues on and they are just so good you do not want to miss out on any part of the saga. There are so many pieces to this story as there are family relationships, lies that have been woven and hidden and secrets as well as adventure and learning to trust. I love how this series has been written as it continues to weave together characters and their individual storylines and capture the reader's attention as secrets and truth are hidden and slowly unraveled. Help Natalie celebrate the release of her new book by entering to win goodies you'll need for a girls' night out with your heart sister! Enter today by clicking the icon below. But hurry, the giveaway ends on May 17th. Winner will be announced May 18th on Natalie's blog. Author Natalie Chambers Snapp uses her own and others' stories of successes and failures to illustrate what she has learned about girlfriend relationships. Healthy boundaries, honesty, tact, sharing, and agape love all play a part in being and maintaining a circle of close confidants. She also deals with the inevitable challenges that face many relationships including how to handle conflict; life changes like a new baby, move or divorce; and when it is right to "break-up" with your friend. Natalie Chambers Snapp is first and foremost a follower of Jesus, then wife to Jason, and mom to one spunky daughter and two spirited sons with a crazy amount of energy. Choosing to follow Jesus at 27, Natalie is passionate about sharing the grace, mercy, and truth of God's love. She lives in the Midwest with her crew and tries to keep it simple by writing about the faith found in the everyday mundane. The outpourings of her heart can be found at www.nataliesnapp.com in the fleeting moments between being a wife and mother. I absolutely loved "Heart Sisters" and Natalie's spirit and heart that she shares in this book. Throughout life we have friends, friends of varying kinds and degrees of closeness. Some of these friends may become life long friends, while others are friends for a season. However, sometimes in the busyness of life it may feel as if there is no time for friends; however there is a longing and need for friends. I feel like I needed this book and what it said as I find myself caught up in the busyness in life and hard to really give friendships that attention that is required to be a good friend. I loved the layout of this book with the space to journal and the discussion questions. This is an excellent read and I highly recommend this for all women to read. And really who could resist this cover?! Suzanne Woods Fisher is the bestselling author of Amish Peace and Amish Proverbs, as well as many novels about the Amish, including the Lancaster County Secrets series, the Stoney Ridge Seasons series, and The Inn at Eagle Hill series. She is also the coauthor of an Amish children's series, The Adventures of Lily Lapp. Suzanne is a Carol Award winner for The Search, a Carol Award finalist for The Choice, and a Christy Award finalist for The Waiting. She is also a columnist for Christian Post and Cooking & Such magazines. She lives in California. Learn more at www.suzannewoodsfisher.com and follow Suzanne on Twitter @suzannewfisher. I really enjoyed this book! I am a huge fan of Suzanne's Amish fiction novels, but this one really allowed me to understand and see the heart of the Amish culture and core beliefs of this group of people. This book is filled with short stories that are inspiring and will lift your spirits in just a few minutes. I love the reflection questions and also the little Amish fact that is shared at the end of each chapter. This book is great for those moments when you need a pick me up or only have a few minutes to read, but it is also perfect for those who may be struggling with forgiving others or moving on from a past hurt. I love Becky's books and I have been enjoying the Porter family series so much and was excited when "A Love Like Ours" released! Jake Porter is the focus of this novel as far as the Porter siblings and he is tall, dark and brooding, but oh so sweet and perfect boyfriend material. Lyndie was best friends with Jake while growing up, but her family moved away, but now the family has returned. Lyndie wants to dive right back into the friendship, but Jake needs convincing and reluctantly agrees to Lyndie working at the ranch. This is only the beginning of the story and I knew I was going to love it and not be able to stop reading once I had started! Jake is struggling with PTSD following his time serving the country which is all too real for so many people. Lyndie's family deals with the fragility of life each and every day with her sister Mollie and yet they have learned that God is good all the time and are at peace in the midst of the trying days. I love the roles that Mollie and Karen and even Lyndie's grandfather all play in Jake's life. I have to say as well how much I love how Becky continues to weave the former characters into this story as I loved Meg and Bo's story as well as Celia and Ty's. Amber is such a loveable character as well and the dating challenge that she and Lyndie make adds so much entertainment to this story! There are just so many wonderful lines in this story and moments that I highlighted and reread while reading this book. I am looking forward to Dru's story next, but also disappointed that it will be the end of the Porter Family series. "A Love Like Ours" is one of my top books this year for sure! Part of New Hope® Publishers' contemporary missional fiction line, Side by Side opens the reader's eyes to the life of Muslims in Sudan as well as some of the struggles that Christians face when living under Islamic law. The reader will be inspired to pray for those who are persecuted for their faith as well as pray for the salvation of those who persecute. "Side by Side" is an eye-opener and relevant book for today. No matter where we all live, our communities are becoming more and more diverse and along with that are opportunities to learn about different cultures, and to also share one's own beliefs. Jana does an excellent job with writing this book as I was immediately drawn into it and the scene was set that I was felt as if I was experiencing the story as well. It is so easy to forget about the struggles that Christians living in other countries may be dealing with on a daily basis and also how other cultures may be treated. This book will help all of the readers to expand their worldview and develop a deeper understanding of life in other countries and become more culturally aware. This is a great choice if you are looking for a thought-provoking and inspiring read. To read other review included on this blog tour, go here!